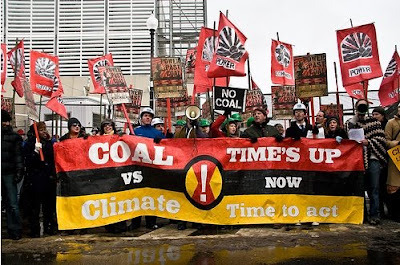 This is the part two of a three-part series taking an in-depth look at the youth climate movement and the stories the mainstream media missed at Power Shift 2009. For the introduction and links to the rest of the series, head here or see links at end of this post. On display at Power Shift 2009 was the diversity of tactics employed by the youth climate movement. From rallies and protests in the streets, to well-informed citizen lobbyists penetrating the halls of Congress, this movement finds strength in a diversity of tactics. In their efforts, these young leaders draw on time-tested community organizing techniques as well as a suite of cutting-edge, 21st century technologies to unite the movement, grow at a rapid pace, and secure climate and clean energy victories. As the briefing commenced in the halls of the Rayburn House Office Building, thousands of students were in the process of holding over 350 lobby visits with elected officials from all fifty states. At 2:00 pm, I got a text message informing me that just blocks away, hundreds more Power Shifters had joined an estimated 2,500, both young and old, and taken to the streets of D.C. to march for an end to the injustices of our current dirty energy system. The march was the start of the Capitol Climate Action, and the assembled protesters soon surrounded the Capitol Plant, which heats the U.S. Capitol Building and the complex of congressional offices by burning a mix of coal and natural gas. The event’s organizers said they targeted the plant in a symbolic stand, calling for an end to dirty energy and a transition to a cleaner, more just energy system. “This power shift, it has begun, we’ll get our energy from wind and sun!” chanted protesters, calling for an end to coal. Groups of protesters illegally blocked every gate to the plant and rallied in the streets surrounding the plant for hours, as speakers including Robert F. Kennedy Jr, author Wendell Berry, and outspoken climate scientist James Hansen addressed the crowd. These more well-known figures were joined by activists and citizens from regions affected by coal’s mining and use, including residents of Appalachian states and Navajo living near Black Water Mesa in New Mexico. The speakers all cited the many impacts and injustices of today’s dirty energy system – from asthma and mercury poisoning to the destructive impacts of surface mining and mountaintop removal, and of course, coal’s massive contribution to climate change. The coincidence of Monday’s lobby day, hearing and civil disobedience evidences the diversity of tactics employed by this growing movement. Energy Action Coalition executive director Jessy Tolkan has spent years registering and turning out voters, organizing events like Power Shift and campaigns like Power Vote, and fighting for a seat at the political table for today’s youngest generation. But as proud as she is of these efforts to amplify the movement’s political voice, she makes sure to point out that the efforts of this movement do not stop at lobbying the political process for change. In fact, the tactics employed by many in this movement may not even look like activism to the outside eye. What occupies much of Timothy Den-Herder Thomas’s activism, for example, looks a lot more like a new brand of socially and environmentally conscious entrepreneurialism. Thomas is a senior at Macalaster College and a leader with the Sierra Student Coalition. He wields financial spreadsheets and non-profit business models in addition to traditional tools of community organizing. On March 2nd, Thomas told Chairman Markey's committee about his successful efforts to establish a revolving clean energy loan fund at Macalaster. The fund enables investments in energy efficiency and clean energy projects at the Minnesota college, pooling the resulting energy savings to reinvest in more projects. Thomas is now working with students as part of a program called Summer of Solutions to take the revolving fund model off campus and launch a new effort to “futurefit” entire neighborhoods – that’s Thomas’s word for the energy efficiency and clean energy retrofits that prepare homes and businesses for a clean, efficient energy future. Summer of Solutions will be organizing efforts in at least a dozen communities this coming summer and similar initiatives are underway in other locations. All across the country, innovative young social entrepreneurs like Thomas are working to transform their campuses and communities, set up green jobs training programs and otherwise get busy creating the clean energy future they are calling for as activists. Their message: while we call on our elected officials to change laws, give us more resources, and invest in a clean energy economy, we’re not going to wait to get started building the future ourselves. This savvy youth movement draws from the long history of community organizing in the United States and the wisdom of past social movements, combining these time-tested tactics with cutting-edge 21st century digital organizing and communication tools with remarkable effectiveness. The most networked generation in history, the members of this youth movement are already utilizing 21st century technologies to unite online and strengthen their offline organizing. Last April, as part of an annual nationwide day of action called Fossil Fools Day, hundreds of young activists traveled to stand with communities in Appalachia to protest the devastating impacts of mountaintop removal coal mining. Through online networks, these activists were able to unite with students located about as far away from the coal fields of Appalachia as you can get: Washington state. 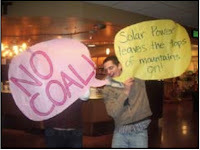 Student organizers with the youth-led Cascade Climate Network quickly launched a “photo petition” to stand in solidarity with their allies in Appalachia, snapping digital photos of hundreds of students at more than a dozen campuses holding signs reading “We can do better than coal!” and “Solar energy leaves the tops on mountains.” Through email, they collected the digital photos streaming in from across the state and quickly designed and produced a photo petition “yearbook” which students then delivered to members of Washington’s congressional delegation [click here to download the photo petition (PDF)]. The Cascade Climate Network students urged Congressman Dave Reichert, a Republican, to co-sponsor legislation that would curb mountaintop removal by reinstating environmental regulations gutted by the Bush Administration. Thanks in large part to the efforts of the Cascade Climate Network students, Congressman Reichert agreed to be one of three chief sponsors of the Clean Water Protection Act, which was re-introduced in the 111th Congress last Wednesday with a record 117 co-sponsors. The unprecedented, networked nature of this movement allows young activists across the country to connect with their peers, share information and best practices, discover and harness synergies, and grow in size and power faster than past movements.